In the sunroom333�444of Grace Cavalieri's Annapolis home, a sepia photo of a U.S. Navy pilot sits atop a hand-crafted Nakashima table. In the picture Ken Flynn sits in his airplane's cockpit, his goggles pushed up on his head, his grin brimming with the confidence only a 22-year-old can have. That photo is the subject of '1952,' a key poem in "The Man Who Got Away," the impressive new book of poetry from Cavalieri, two-time winner of the Allen Ginsberg Award and acclaimed host of a radio show, "The Poet and the Poem." This book is Cavalieri's "small paper monument," in her words, for her husband Flynn, who died on Jan. 15, 2013. But the volume is also a guidebook for anyone coping with the dislocations of loss. For in the wake of death or abandonment, we find ourselves moving involuntarily between the realms of the past, present, future and imaginary. What Cavalieri proves especially good at is capturing the willy-nilly fluidity of those transitions. This poem, for example, begins with Flynn's photographed smile from 1952, but it slips almost imperceptibly into the 1960s, then '70s, then 2000s, then now, when there is "so much sun outside without you," and then back to 1952. But the photo's beaming optimism is now revealed as "a moment that could not last," for the future he was looking forward to is the narrator's past, and she is left alone with the evidence that all things are transient, even the most important person she had ever known. "That was the first poem I wrote after his death," Cavalieri says. A short woman with dark bangs and wide eyes, she leans forward at her dining-room table in a bright red pullover and black denims. "But after that a lot of them came right away. After the weeks of visitors were past, I'd sit in that sunroom, eat breakfast, and look at that photo. It was very easy to start talking to the photo and say, 'There you are,' and the poem just came out. Whenever I've tried to read it in public, I can never get through the last part without stopping, so I don't even try anymore." Cavalieri has been a large presence in the Baltimore-Washington poetry scene for almost five decades. In the early '70s, she taught poetry at Antioch College's Baltimore, Columbia, and Washington centers and later at Maryland's Glen Echo Park. 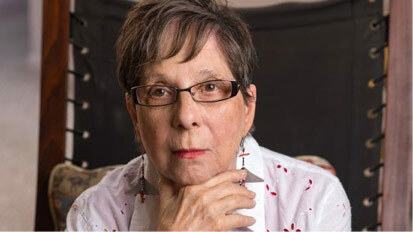 She has written 26 produced plays and 17 books and chapbooks of poetry. She was an original staff member of WPFW-FM, the nonprofit Pacifica radio station, when it opened in 1977. The station provided a home for her weekly, hourlong program, "The Poet and the Poem," which still mixes interviews with readings. After 20 years at WPFW, the show has been sponsored by the333�444Library of Congress333�444ever since. She has lived nearly half her adult life in Maryland. Her companion at many a reading and literary event was Flynn, the Navy pilot turned anti-war activist, champion swimmer, and successful sculptor. The couple's daily swimming regimen sparked another key poem in the book, 'Fixation.' "I plunge under the water and pretend Ken's in the lane next to me . . . ," she writes, "where it is shining ribbons off the bottom." In a moment the poem is no longer in the333�444Naval Academy333�444pool; it's in Key West on a past vacation with the narrator's husband. There is conch soup, hibiscus flowers, and tequila at sunset, but suddenly "a sound breaks my trance and I realize that it's coming from my own throat/ Like the clacking the cat makes when watching the birds outside/ It's caught like a squeal under water a squeezed sob and I climb out/ And I rush past midshipmen who're laughing and telling their jokes and complaints." It's a remarkable poem, because it reveals how easily we can slip into a comforting memory only to be rudely grabbed back by the present, forced to gulp down its cold air after spitting out the chlorinated water of the past. "Swimming was a big part of our lives," Cavalieri says. "I could show you the boxes of Ken's medals, and Key West had our favorite pool. After he died, I kept swimming at the Naval Academy. One day I was under the water, and I heard someone sobbing. I looked around to see who it was, and it was me. I had been in one realm, but suddenly I was in this realm. "That's one of the advantages poetry has over prose: It can move back and forth between worlds more easily because it isn't as grounded as prose. I wasn't interested in just remembering; 'remembrance' is a Hallmark word. But where the past meets the present is a profound place." The past meets the present in yet another way in this book. The 34 new poems that Cavalieri has written since her husband's death are joined by 24 previously published poems about him. "I started going through my old books just to be with him again," she explains. "Then it hit me: 'Hey, these poems aren't bad; they really say something about Ken.' When I put those old poems next to his death, they started to live again but in a different way." She insists that writing is no substitute for grief. Because writing is always looking for bridges between the mind and the spirit, it always short-circuits the purely emotional catharsis that true grief requires. But those bridges are invaluable when you're trying to find your way back from grief to a livable daily life, when you're trying to move from realm to realm without falling through the cracks. "I wish I could say that writing was my salvation," Cavalieri says, "but in fact writing was what I did instead of grieving. Yet writing was a way I could rekindle a life. Writing provided tethers to the world. Here you are, after a death, without any support, any hydraulic system33�44where do you turn? "Well, you can trust language to say something that makes sense, at least for that day. And for me writing is a habit, I'm always jotting down lines; even in the hospital I was scribbling notes about the nurses and life-support machine. Most of my life I've been getting up every day at 5 a.m. to work on poems. So I kept doing that."